d i v e r s i t y w o m a n . c o m W i n t e r 2 0 1 7 D I V E R S I T Y W O M A N 23 We Mean Business > By Kimberly Olson E arly in Brian Little's career, conversations with senior lead- ers caused something to click. "What I really liked at that time was being able to talk to a CEO or CFO," he says. "I enjoyed learning about their work and how they saw people." During his 25 years in human resources—from customer service to operational roles— he's been on a mission to create a positive work culture that supports employees and sparks collaboration. 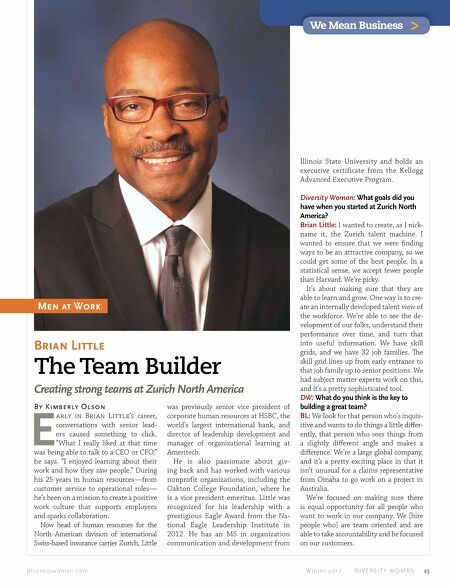 Now head of human resources for the North American division of international Swiss-based insurance carrier Zurich, Little Men at Work Brian Little The Team Builder Creating strong teams at Zurich North America was previously senior vice president of corporate human resources at HSBC, the world's largest international bank, and director of leadership development and manager of organizational learning at Ameritech. He is also passionate about giv- ing back and has worked with various nonprofit organizations, including the Oakton College Foundation, where he is a vice president emeritus. Little was recognized for his leadership with a prestigious Eagle Award from the Na- tional Eagle Leadership Institute in 2012. He has an MS in organization communication and development from Illinois State University and holds an executive certificate from the Kellogg Advanced Executive Program. Diversity Woman: What goals did you have when you started at Zurich North America? Brian Little: I wanted to create, as I nick- name it, the Zurich talent machine. I wanted to ensure that we were finding ways to be an attractive company, so we could get some of the best people. In a statistical sense, we accept fewer people than Harvard. We're picky. It's about making sure that they are able to learn and grow. One way is to cre- ate an internally developed talent view of the workforce. We're able to see the de- velopment of our folks, understand their performance over time, and turn that into useful information. We have skill grids, and we have 32 job families. e skill grid lines up from early entrance to that job family up to senior positions. We had subject matter experts work on this, and it's a pretty sophisticated tool. DW: What do you think is the key to building a great team? BL: We look for that person who's inquis- itive and wants to do things a little differ- ently, that person who sees things from a slightly different angle and makes a difference. We're a large global company, and it's a pretty exciting place in that it isn't unusual for a claims representative from Omaha to go work on a project in Australia. 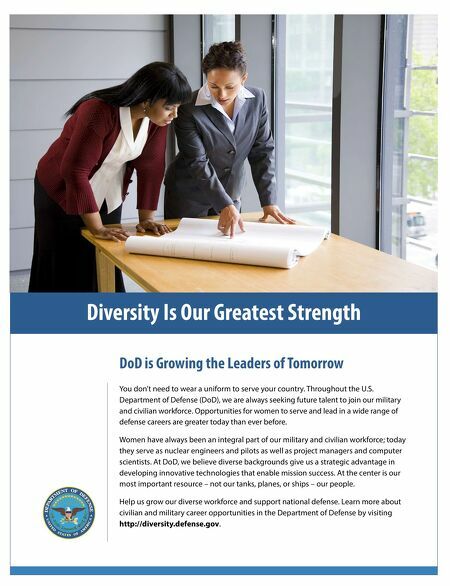 We're focused on making sure there is equal opportunity for all people who want to work in our company. We [hire people who] are team oriented and are able to take accountability and be focused on our customers.